There is so much in spirituality, whatever path, that can take us to heights of experience & understanding that we could never have dreamed of. Each progressive step takes us further & further to understanding that there is so much that we don't know, there is so much more to experience, & quite frankly, it is surely humbling. Some spiritual paths, & I am not only talking about yoga, favour the consciousness/male gods aspect...Shiva, Ranginui/the sky father, ...whatever name he is known as on your path. 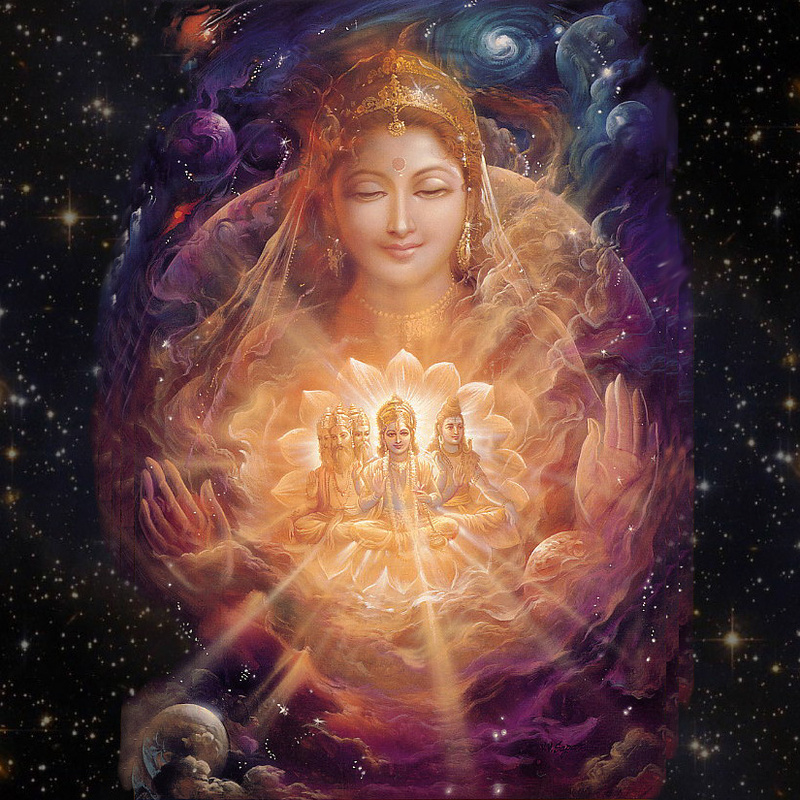 But others favour the path of the Divine energy, the goddess: Shakti, Papatuuaanuku/earth mother. Because goddesses are to do with manifestation & energy, the way of the goddess is an easy path. It is a path of doing. The consciousness/male god aspect flows in tandem with the energy/goddess path, for one cannot exist without the other. For myself, I feel that too. So, I prefer to appreciate both the Gods and Goddesses. Especially as each God or Goddess gives us something unique to themselves. Mostly though, they give a Cosmic state of being: consciousness and love. What a blessing. How lucky are we? I learnt, studying with a Tohunga, that The Gods and Goddess have many manifestations. Each manifestation is like a lineage. The Gods, and The Goddesses, are descended from the Supreme God, and there is a descent of these gods and goddesses creating this lineage. It is the same of course, in yoga. The Supreme Goddess, from whom all the Goddesses are descended, is called Parashakti. The supreme Goddess. These days many are familiar with Kali The Great Mother and Goddess of removing the limitations of our ego. We need an ego, or ordinary sense of oneself, in a lifetime, but Kali takes us above our ego as she awakes the sleeping Higher Consciousness within us. When this happens to an aspirant, this is a true step into the Higher Knowing that is within us. Kali helps us to get there. Lakshmi is the Goddess of wealth, health, fortune and prosperity. She is said to walk amongst us during the Hindu celebration of Dewali, and to invite her into your home during this time brings great blessings. Lakshmi also bestows spiritual wealth and blessings and this is special indeed. Saraswati is quite ethereal. She is the goddess of knowledge and spiritual wisdom, the arts, music. These three, Kali, Lakshmi, and Saraswati are like a trinity. Their attributes and gifts to us, compliment each other. Later in the year, in the celebration of Navaratri, the nine nights of the Goddess, we can meditate on them for our own benefit.